Collecting Antique Ceramics offers the widest range of opportunities for antique collectors, buyers, and sellers. When collecting antique ceramics, you are collecting some of the most delicate, most beautiful and most varied items that manufacturers can produce. There are vastly more antique objects made of pottery, porcelain, earthenware or stoneware than of any other material and you probably have some beautiful antique ceramics in your home. You are more likely to possess antique pottery and porcelain than you are antique silver, glass or furniture. The care, beauty and craftsmanship manufacturers and artists build into the form, and the decoration of pottery and porcelain is only rarely surpassed by items in other fields of antique collecting. And this draws antique buyers & collectors from all walks of life. Sales of Royal Doulton and Royal Worcester collectibles continue to rise and prove to be a wise investment over the longer term. But a large percentage of us have no idea what we have inherited from parents or grandparents, or what we have in our attics, cellars, garages or the back of rarely opened, cupboards and box rooms. The antique marks site will, hopefully, help you uncover the beauty of your own possessions and will also help you buy or sell profitably in the future. Read on and understand the basics of antique ceramic, pottery and porcelain forms, glazes, and decoration. Types of Antique Ceramic, Earthenware, Stoneware, and Porcelain. There are three main types of ceramic material. Coarse-grained earthenware and harder stoneware that go to make pottery, and the more delicate and fine-grained material collectively referred to as porcelain. Use coarse sedimentary clay which contains many impurities and can only be fired to around 800°C. when fired the grains of the clay stick together to form a hard structure with tiny air gaps throughout. The gaps allow water or moisture to soak through the structure and this means earthenware must be glazed if it is to be used to hold water. 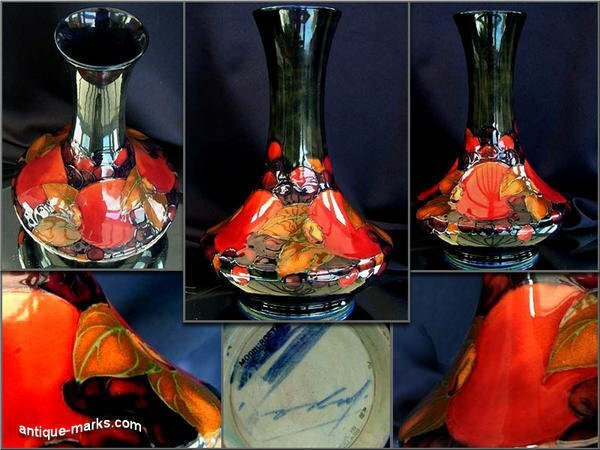 The clays come in many colors which can only be seen if a transparent glaze is used. Colour can usually denote the origin of the clay. Torquay ware uses rusty orange and iron rich Devon clays. Creamware uses good quality white Devon clay which can be fired at higher temperatures. Are harder than earthenware and have a finer texture. It can hold water when unglazed. Stoneware clays can be fired to around 1300°C. Most clays are gray and colored stoneware objects usually only have a skin of color. However, Chinese Yixing stoneware is red all the way through. Black basalt and jasperware are forms of fine stoneware first produced by Wedgwood in the mid-18thC. They were first produced by the Chinese in their late Tang dynasty over 1000 years ago. True, hard-paste porcelain is watertight when glazed or unglazed. Porcelain can be white, grey or creamy and it is strong, delicate and usually translucent. 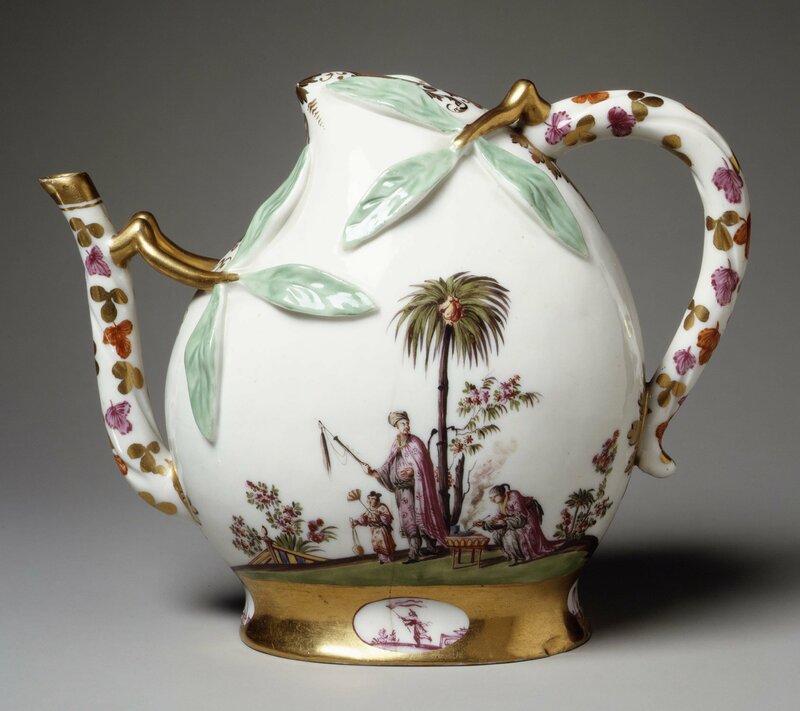 Meissen produced the first true competitor to Chinese porcelain in 1708. Porcelain can be fired at over 1400°C and the higher the firing temperature, the better the ceramic paste changes into an impermeable glassy body. Porcelain is usually hard to scratch. A soft-paste porcelain was produced in Europe in the 16thC, it fired at 1100-1200°C and was developed by adding glass, flint, quartz or bone (bone china) to the clay. This depends on the composition of the paste (the paste is the material used to form the body of a piece of porcelain). 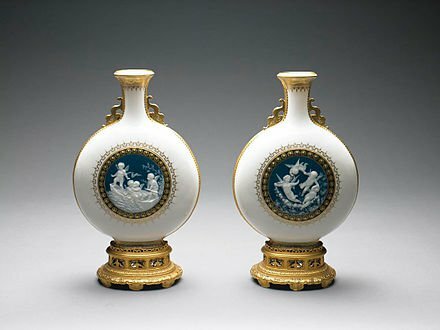 One of the earliest European porcelains was produced at the Meissen factory and was compounded from china clay kaolin, quartz and alabaster and was fired at temperatures more than 1350-degrees Celsius to produce a porcelain of great hardness and strength. At a later date, the composition of Meissen hard paste was changed, and the alabaster was replaced by feldspar, lowering the firing temperature required. China clay, feldspar and quartz (or other forms of silica) continue to this day to provide the basic ingredients for most continental European hard paste porcelains. Its history dates from the early attempts by European potters to replicate Chinese porcelain by using mixtures of china clay and ground-up glass or frit; soapstone and lime were known to have also been included in some compositions. As these early formulations suffered from high pyroplastic deformation or slumping in the kiln at raised temperature, they were uneconomic to produce. Formulations were later developed based on kaolin, quartz, feldspars, nepheline syenite and other feldspathic rocks. These formulations were technically superior and still continue in porcelain production. Although originally developed in England to compete with imported porcelain, bone china is now made worldwide. It has been suggested that a misunderstanding of an account of porcelain manufacture in China given by a Jesuit missionary was responsible for the first attempts to use bone-ash as an ingredient in Western porcelain. In China, the china clay was sometimes described as forming the bones of the paste, while the flesh was provided by refined porcelain stone. For whatever reason, when it was first tried it was found that adding bone-ash to the paste produced a strong white, translucent porcelain. 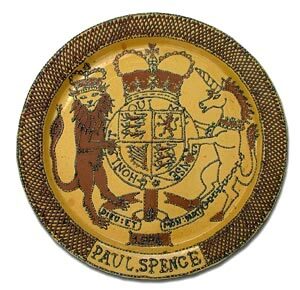 The base and trade marks on antique pottery and porcelain. The incised mark is applied by hand after making the basic model in china clay and before the first firing at about 900 °C (biscuit firing). The clay is still soft and this makes it easy to apply the mark. Impressed marks follow the same procedure, but the mark will be stamped into the clay. This method is sometimes used to identify undecorated white porcelain or white blanks. The underglaze mark is a handpainted or printed mark that is applied after the biscuit firing but before the glaze is applied. Metal oxides are used that are resistant to the high kiln temperatures of the glaze-firing process (about 1400 to 1450 °C). Cobalt is the most commonly used metal oxide, and it gives an underglaze blue mark. The overglaze mark is a handpainted or printed mark that is applied after the glaze firing and before the final firing. Painted marks, usually name or initial marks, are added over the glaze at the time of ornamentation, as were some stenciled marks. Painted marks also use metal oxides that can be used during the final firing which is not as high as the glaze firing process (about 800 °C). You will find overglaze marks in different colors, however red (iron oxide) and green (copper oxide) are used most. Gold can also be used, but the temperature in the kiln during the final firing process cannot exceed 400 °C. 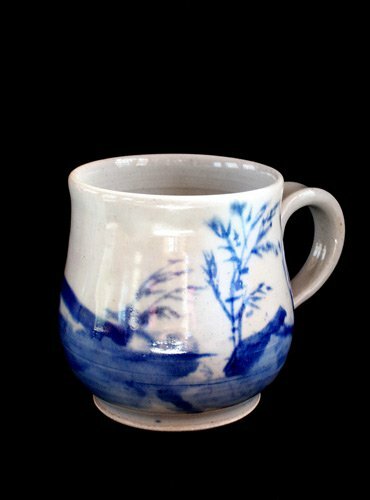 Overglaze marks are used by painters and decorators on previously glaze fired objects. The types of decoration & glazes on antique ceramics. 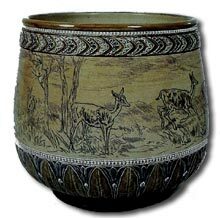 Decoration on antique pottery and porcelain is usually either underglaze or overglaze and painted or printed. Sometimes the glaze may form the only decoration. After application, the ceramic is fired, and the powdered coating melts into a hard, glass-like coating. A ceramic glaze is usually for decoration or protection, and most glazes can be considered specialised forms of glass. Glazing is functionally important for earthenware vessels, which without it would be unsuitable for holding liquids. In addition to the functional aspects, aesthetic forms include a smooth, pleasing surface, the degree of gloss and variegation, and finished color. Ceramic glazes can also enhance an underlying design or texture which can be the natural texture of the clay or an inscribed, carved or painted design. Can be applied by dipping pieces directly into the glaze, pouring the glaze over the piece, spraying it onto the piece with an airbrush or similar tool, with a brush, or with any tool that will achieve the desired effect. To prevent a glazed article sticking to the kiln during firing either a small part of the item is left unglazed or special supports, called kiln spurs, are used then removed and discarded after the firing. Small marks left by these spurs can sometimes be visible on finished items. Good early antique Derby porcelain figures without base marks can usually be identified by the three pad marks left by the supports derby used during the firing. These were usually based on lead and tin, which produced an opaque white finish. Early soft-paste porcelain has a colorless lead glaze, but later soft-paste porcelain had crushed flint or glass added to the glaze. Lead glazes were used until the 19th century when less dangerous materials were found. Crackle glaze, cracklure or crazing – occurs when the ceramic body and the glaze shrink at different rates, as they cool. 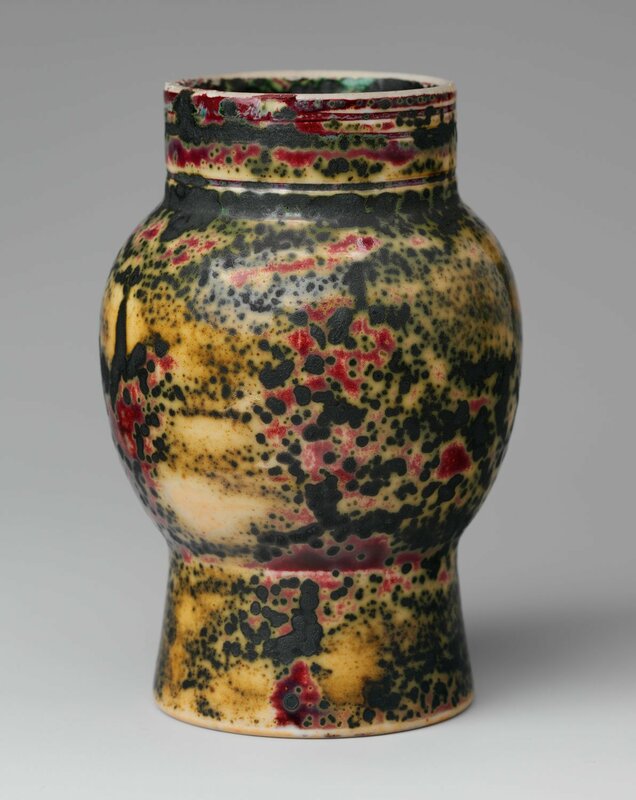 A crackle glaze is highly desirable on some items; particularly Japanese Satsuma wares. Is when a layer of decoration is added on top of the glaze, usually before it is fired. The color borders can usually be seen on close inspection or felt with the fingertips. Overglaze colors on porcelain were usually applied using enamel paints, because of the variety available and as they did not have to withstand the very high firing temperatures. Different enamels were applied based on their firing temperatures, with the highest applied first, and gilding fired last. Is when a pigment is applied to either an unfired or biscuit-fired piece of pottery before being coated with the glaze. The pigment fuses with the glaze when the piece is fired, either for the first time or during the glost firing. The design pigment applied would be a metal oxide such as cobalt, chromium, manganese or iron. When fired the oxide produces a color that appears to come from within the body of the ceramic. A good example of underglaze decoration is the popular “blue and white” porcelain where the blue color is produced by using a cobalt pigment. Copper pigment produces green or red, iron produces red, and manganese produces purple. To test for underglaze or overglaze color hold the item so that sunlight falls across the pattern. If the light obscures the pattern, then the pattern is under the glaze. Is where porcelain paste is built up in layers against a contrasting color ground to produce a piece that resembles cameo glass as the Meissen wall plaque on the right. Both Meissen and Minton are famous for the quality and excellence of their pate-sur-pate decoration, and their pate-sur-pate products are among the rarest and most expensive pieces to come to the market in the modern age. Reticulation is produced by piercing the still soft clay with a variety of different tools to produce an intricate latticework effect or pattern, before firing the object. Is when molded or stamped clay in decorative shapes is stuck onto the ceramic object with thin slip before the firing. The decorative shapes are usually in the form of sprigs of flowers or leaves. Wedgwood is famous for their classical sprigs on jasperware. As the Ulysses sprig by William Hoffman on the left shows. Is created by dipping the object in pale slip then trailing various colors of slip on top of it in intricate patterns. Staffordshire trailed slip – Is a thin, buff-bodied earthenware coated with white and dark slips and decorated with trailed, combed, or marbled designs. The white slip covers more of the visible surface than the dark slip. A clear lead glaze gives the piece a yellowish background color. Sometimes the visible light and dark slip are reversed, producing a brown vessel with yellow decoration. 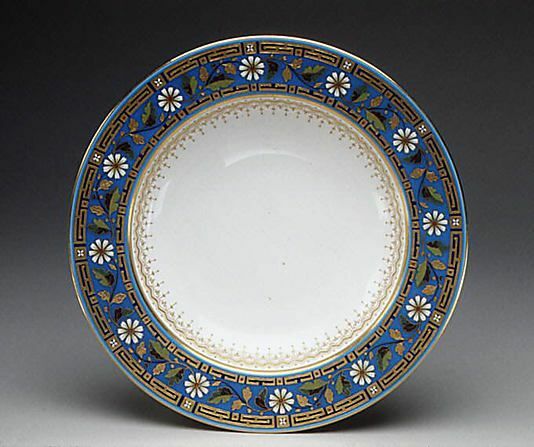 Slipware was made in the Staffordshire region by the mid-17th century and the first well-known Staffordshire slipware products were the elaborately decorated ornamental dishes and chargers popularly called Toft Ware, after the Toft family of potters. Is produced when the ceramic object is dipped in a colored slip, and the artist then carves patterns in the slip to reveal the contrasting colored ground beneath. Doulton, Hannah Barlow is one of the most sought after sgraffito artists, famous for her naturalistic animal scenes on Doulton Lambeth stonewares. Collecting antique ceramics, whether porcelain, pottery or china, can be one of the most rewarding and addicting forms of collecting. Always try to specialize in a certain type, maker or even an artist or glaze to ensure your collection is focused and a true passion.